Tucked inside your entryway, underneath the bedroom window or in the hallway where everyone changes shoes, furniture like the Amish Arched Back Empire Bench stands out in solid wood style. 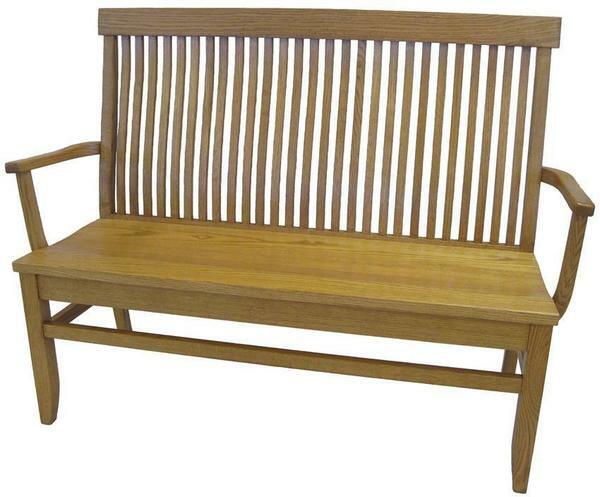 With a supportive back and solid legs and arms, this wood bench will serve well for generations. Wood benches seat a few more and add an intriguing piece of furniture to your home collection. Who doesn't like to cuddle up on a bench? With rich framework and an inviting solid wood display, the Empire is made to add to your family home with comfort and beauty. Measures 40" high, 18" deep and comes in three widths including 36", 48" and 60"
We can't wait for you to see your new Amish made furniture. So much care is put into every joint, curve and cut and it shows. This is furniture that will remain part of your family story for always. Please email or call a member of our team with any questions. We are happy to help. We can be reached at Questions@DutchCrafters.com or Toll-Free at 866-272-6773. Thank you for shopping with DutchCrafters.